La Via Campesina Sign: We continue the struggle for land and territory. The gruesome March 3rd murder of Berta Cáceres, the Honduran human rights and environmental activist, turned many eyes, ears, and hearts towards her Central American country. While Cáceres’ Honduras is the most dangerous country to be an environmental activist, the struggle amongst peasants and indigenous communities to reclaim land, is active across national boundaries. This is something Cáceres’ understood. It is no surprise then, that at a March 31st discussion, hosted by Latinx, a student group in MIT’s Department of Urban Studies and Planning, leaders from Brazil’s Landless Workers Movement (MST) and La Via Campesina, were embodying and discussing the importance of considering resistance at the transnational scale, even as they paid tribute to Cáceres’ legacy. 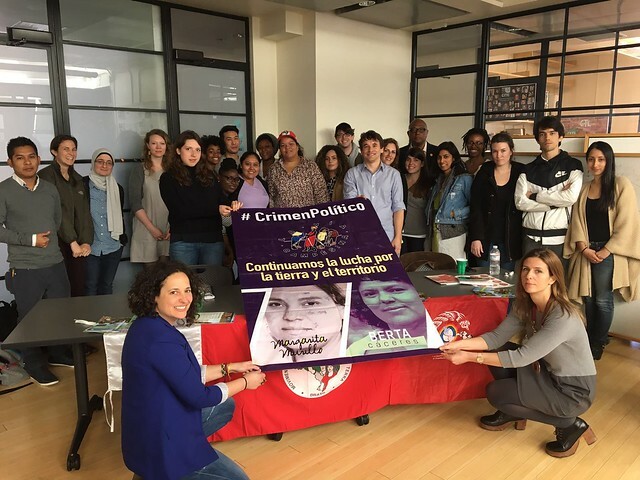 Deborah Nunes Leno Da Silva hailing from Brazil and Yasmin Lopez from Honduras spoke through Portuguese and Spanish translators from the Friends of the MST and the non-profit Grassroots International, as they shared the work of their social movements. 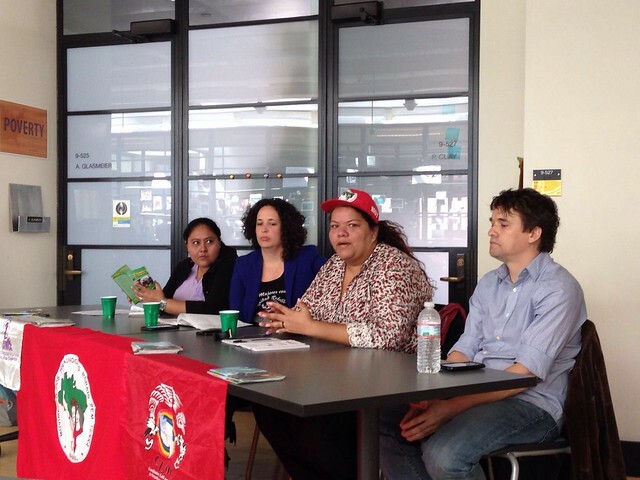 Lopez is a member of the Women’s Regional Commission of La Via Campesina- Central America. This global social movement led by landless peasants is focused on the advancement and preservation of small-scale agriculture to promote food sovereignty, social justice & dignity. Acknowledging the transnational nature of the struggle for food sovereignty and human dignity is key to Lopez’s and La Via Campesina’s analysis. “The criminalization of the struggle and inequality isn’t just a problem in Honduras it is a worldwide struggle,” Lopez argues. In recognition of this, the movement is engaged in international advocacy for the recognition of the rights of peasants around the world. Yasmin Lopez and Deborah Nunes Da Silva with their translators. Deborah Nunes Leno Da Silva is a member of the National Coordination of the MST. The MST was created in 1984 as a mechanism to resist the concentration of land amongst latifundia and later, large agri-business companies in Brazil. Their three objectives are to resist land dispossession in the countryside, push for agrarian reform, and build a socialist society. Since the start of the movement, one of the MST’s major tactics has been to occupy land. They choose land that violates Brazil’s three part constitutional requirement that requires the resource be put to use in a manner that is productive, does not create a negative environmental impact and respects labor laws. What does solidarity from the academy look like?